let me preface this post by saying that i've been thinking about this bag for a long time. this is the splurge of the year, not to mention the last bag (or sartorial item in general) that i'll buy for a long time. i am very excited for it to arrive later this week. i agonized over purchasing it for two years, and stalked various vintage ones online before finally saving up for this one. now i feel both thrilled and guilty, partially because i grew up in a household where thrifty living was valued above all else. i sometimes wonder if my love for beautiful (and often expensive) things is some sort of moral failing. i certainly did my share of rebelling against my parents' values, but now that i'm no longer a teenager, i've slowly evolved my own style ideas to coincide with my tastes. simply put, my love for fashion and design is how i express my attempt to live an aesthetic life, and sartorial items are basically my only splurge. in general, i don't go for logos and hardware on bags. none of my other bags have them. however, i've always liked the slightly outré details of the Chanel classic flap (compared to the 2.55). i also prefer the leather-and-chain straps rather than the all-chain 2.55. at first glance, this is a bit of an 'out of character' acquisition compared to the rest of my collection. however, partially due to those reasons, it has become a must-have for me. i have a love-hate relationship with this bag due to the status-symbol associations with the CCs and the numerous celebrities who wear it, but at the end of the day i love the vintage classic flap because it is such a brilliant and iconic design. 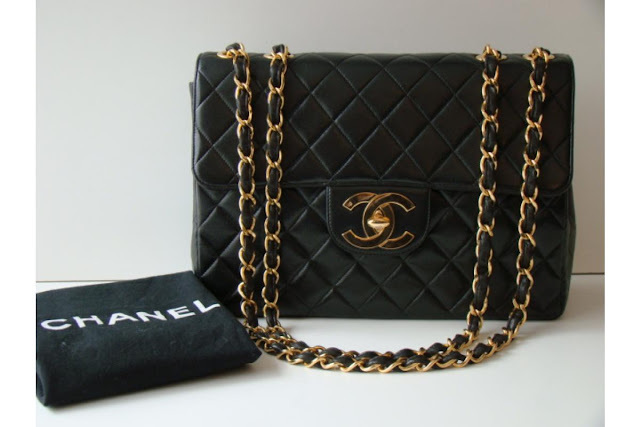 so my love for this vintage Chanel bag is a complicated one. what about you? do you have any items in your wardrobe (or a wishlist piece) that embody this mix? Don't feel guilty. It's hard to explain why we like certain things. Sometimes the answer is simply, "It's beautiful." And this certainly is! Chanel bags belong to that rarefied group of objects that are incredibly well-branded. Paris Hilton carries them, sure, but so does Taylor Tomasi. my mom gave me her LV damier bag, and i feel very weird carrying it around. it's a very structured small bag, and i don't feel polished enough to use it. i feel like your vintage chanel is more versatile and such a classic piece. I splurged on a Céline mini shopper in January and at first, I felt rather awkward carrying such an expensive bag to school but then realised most people would see as a pretty bag than a designer, posh bag at first glance anyways; so now I feel much more comfortable with my bag and carry it everywhere. V: ah, thank you. :) you're right. and it feels funny that i am hoping to get some 'moral support' from my lovely fellow bloggers and readers on this. hehe. but yes there is something uniquely covetable about this Chanel bag. i really like Taylor Tomasi actually - she and Yasmin Sewell are two of my favorite stylish women who regularly show up on style blogs. i understand you 100%. but at the end of the day, you're not conflicted INSIDE about the bag, you're feeling pressure from outside NOT to like it because of the celebrities who carry it, etc. you - we - should never feel ashamed or conflicted about the things we love. we love what we love! carry it with pride. i can't wait to see how you work it into outfits!!! OMG!!! I'm drooling. That's so a lovely, classic bag. I love that you got a vintage one, instead of a new one (I hear the quality has gone down in recent years). The size of this bag is so unique. I also often wonder if my love for beautiful/expensive things is a moral shortcoming. I also wonder how I will balance my love of fancy things with more "grown-up" responsibilities (kids, mortgage payments, etc.) in the future. Finally, I think I have this complicated relationship with all of the nice pieces in my wardrobe (which, at this point, I'd say 85% of my wardrobe is made up of "slow fashion" labels). To sort of echo K's point, I feel awkward carrying nice bags and wearing nice clothes to school. I hate it even more when my colleagues ask where I got a certain item of clothing from. Often, I give some vague answer like, "some small boutique in Brooklyn" to avoid feeling judged. That probably sounds super crazy, doesn't it? K: thanks for stopping by! :) your Celine sounds lovely. would love to see it on your blog perhaps. i've really liked their designs (RTW and accessories) since phoebe philo got on board. i do intend to carry my Chanel everywhere. i'm most excited about how it'll be equally functional as a compact day bag that goes seamlessly into night. jennifer: thank you :) i had heard about the quality declining as well. i also dawdled about whether i should get the jumbo or the (discontinued) jumbo XL. but in the end i think the jumbo is the right size. big enough to be functional but not so big that it loses the Chanel elegance. we totally need to get coffee and bond over your last point, which doesn't sound crazy at all. ha! :) i know exactly what you mean, especially about the colleagues issue...i think this would be a little bit of an issue in many workplaces, as one doesn't want to be unnecessarily judged by others. it's a tricky balance as 'dressing appropriately' in a professional setting goes way beyond just wearing slacks and a blouse. This reminds me of a friend of mine that saved for 2+ yrs to buy a birkin, but her husband is vehemently against her spending that much on a bag, which ruins its appeal for her. She may settle for a bayswater, which I had previously tried to talk her into. Unfortunately celebrities and overexposure do tend to "ruin" things or even make things "grow" on you. I only find myself coveting LV bags when I see someone very chic with one. I found the most perfectly functional wallet as part of that collection, but I just can't bring myself to spend that on a wallet, esp. when I want it for travel. Maybe if I had less things than what I do now, I would consider spending more. But I suppose I do have a love/hate relationship with certain pieces, esp. if they were bought without seeing them in person. When I can get "stuck" with something that's not quite what I expected. Fashion's holy grail! Great choice! Beautiful bag! It's interesting that you consider this an "out of character" purchase, because my first reaction was that this would fit into your wardrobe perfectly (at least what I've seen of it). I like this bag best when it's worn in a sort of casual way, and you have a knack for that interesting mix of laid back and luxurious. I think it's beautiful, and I'm speaking as a fan of the 2.55. I'd been looking for a small day bag that wld also look chic for evenings and I'd come to realise that the quilted Chanel purse is really a good piece of design - not much has changed since it was introduced in the fifties, and so many modern bags are based on its design - it's a true classic, no matter how overexposed it is. Last year I went into Chanel and found myself in a trance-like state after I tried the re-issue 2.55 in navy - I still think Chanel is a little too glamourous for me but for just one moment, I understood why people paid that kind of money for it. I think you're going to have a lovely time using it, congratulations! I agree that the Jumbo XL is probably a bit too big. Your bag is so versatile and will transition from day to night really easily! Aaaaand, yes! We really should talk about this sometime soon! You're right that it would be an issue in workplaces as well as in our departments (which we can sort of consider as a workplace, I guess). pret a porter: it's really unfortunate that your friend's husband is so against the idea. i mean, if it's her $$ and she planned the purchase, why should he interfere? i'm lucky that my boyfriend is pretty chill and understanding of my sartorial obsessions. the mulberry bayswater is a fine bag in it's own right, but your friend should be able to get what she really wnats! lin: thanks! it's funny, isn't it, that the more you try to look for something different, you end up going back to the same 'originals'? i think the LV speedy is like that too. i think the popularity of the Chanel classic and the 2.55 is the fantasy element. it really is such an iconic piece of fashion history that one can own in that way. and of course pass onto your daughters! jennifer: yep. i have to de-program myself from time to time that not every bag needs to be able to fit an overnight stay's worth of stuff. but now i'm satisfied that i have a small but diverse collection of bags that suit every purpose. I got the same mixed feeling (love/guilty) when I finally pulled my trigger on a Chanel last Fall. Just could not ignore the fact that those money can be a decent foreign trip (more enlightening & less materialistic???) or a better investment in stock for retirement. Not to mention the amount could sponsor many children via Charity org (Errrh, I feel terrible right now typing this) Anyhow I bought the bag at my 3rd time boutique visit as it is a seasonal item & would not sitting there forever for me. I do not regret the purchase, whenever I take it out of the dustbag, I smile. Agree with the others: Enjoy & dun think too much. Wear it all the time! Wow. This is a huge purchase, but I'm not sure anyone could ever regret buying something like this. I used to want a Chanel but have since realised it's not exactly my style and if I was buying it it would simply be because it is Chanel. Treasure it, I'm sure you made the right decision. It's beautiful and you will use it forever, congratulations! I really agree with S - you may feel it is an out of character purchase, but the way you wear it will ensure it slots perfectly in to your wardrobe. You'll wear it in such a way that it is a subtle addition - in an outfit where the Chanel element isn't what you notice first, but where you appreciate the person's style, and then clock the Chanel as the icing on the cake. I think the jumbo flap is perfect! Great choice! I have been searching for the same bag, who did you go through to acquire it? I think the bag is lovely and will last you a lifetime. Enjoy it. If anyone decides to question your choice, remind them nicely that purchases are personal and that you do not reproach or question theirs. My watch is my one truly indulgent piece (Hermes Cape Code w/black leather double wrap band). If someone questions me about it, I explain that while I have chosen not to own an engagement or wedding ring (another thing people love to judge), that this is my one piece of important jewelry and I've worn it daily for ten years and that I hope to never have to buy another watch again. They don't have much to say to that. Again, it is beautiful. Enjoy! nanashi: yeah it's important to wear things with conviction :) sofia coppola and michelle williams both wear luxury comfortably and always look like they're being themselves. very inspiring! po: oh! i'd love to see your chanel :) which one did you get? i know how you feel - but there are many ways to give back, so a personal splurge once in a while is fine if it's balanced out! asha & ammu: thank you! Olivia: aw thanks for the really sweet comment. really can't wait for it to get here. i'm glad i took so long to decide to get it though. somehow makes it feel like a more well-considered splurge! Mess2Mrs: i got it from Portero - they specialize in selling gently used/vintage luxury goods. Lisa: thank you :) your Hermes watch sounds wonderful. that's the best kind of purchase - one that becomes a part of your own personal history. it's funny, because it's very tempting to think that you'll just scrimp on everything that you can, and an Hermes or Cartier watch seems so astronomical. but i think incrementally it's actually quite easy to spend a lot more over time buying cheaper, poorly made goods and i think the best is always to have fewer items that are exceptional, heirloom pieces. As an aside, I was reminded by the workplace attire comments of something a friend said once: dress for the job you want, but don’t give them the impression they’re paying you too much. I've heard the quality of the vintage ones are much much better than those that the stores are selling these days. Congrats!! The more I look at at your bag, the more I want it.. I have never been a Chanel-girl but this bag is gradually growing on me..
Lovely bag. Congratulations. Wear and enjoy it in good health. Doesn't it feel good to save up for something that you love?